If you have an outdoor cat, or an indoor cat that likes to sneak off from time to time, it’s a good idea to get your furry pet a collar with identification tags. Generally speaking, uncollared pets are treated differently than collared ones simply because they’re more viewed as strays than actual pets. Collared felines with IDs, on the other hand, get all the right attention and can be returned to their owners in case they get lost. To help you keep your kitty safe and sound, we’ve read hundreds of cat collars reviews and tested dozens of them, and the following 8 came through as best in terms of price, durability and adjustability. Read on to find the best cat collar for your feline companion. Affordable, safe and comfortable, the Coastal’s ElastaCat is the perfect collar if you or your cat are beginners to using and wearing them. The sturdy quality guarantees the collar won’t tear or break easily, while the elasticity ensures it will expand and release in case the cat gets entangled. Whether your four-legged pet is young and tiny or mature and big, this collar has you covered – with a buckle feature that allows adjustment, you can easily adjust the collar to any size. And reflective strands that are woven in the collar along with a reflector tag provide extra safety even at night. 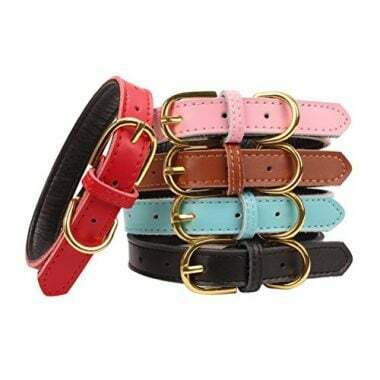 As a bonus, the collar comes in a range of colors, so you can pick the style that best compliments your pet. If you’re looking for a strong and durable cat collar that also looks fashionable, the Aolove’s pet collar may be the collar for you. Leather and alloy make this collar particularly sturdy, while the nickel-plated hardware and heavy-duty D-ring help protect the kitty’s neck. Importantly, there are 5 holes in the collar that ensure adjustment is easy and the item fits perfectly every pet, no matter its size and weight. The Aolove comes in many colors and sizes, so picking the right collar for your feline friend is pretty easy. Generally, the XS and Small size seem to fit most cats, but you should always check the size of your kitty’s neck before purchasing the collar. Absolutely adorable, comfy and adjustable, the Lionet Paws collars for cats and dogs can make any pet look handsome and fashionable. The fabric is made out of 100% cotton, while the buckle is stainless steel, ensuring good quality and durability, as well as a perfect fit. As the manufacturer states, each bowtie is hand-sewn and then attached to the collar with an elastic strap. 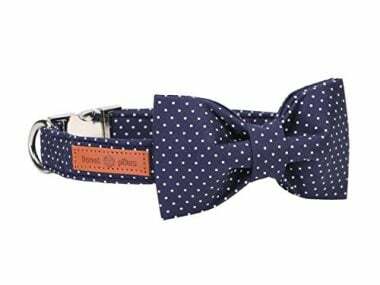 This means that the bowtie can be attached to any collar easily and with no alterations, as well as removed if it needs washing (water and mild soap do a great job). With a wide range of colors, patterns and sizes, it’s easy to find the perfect collar for any cat – just measure your kitty’s neck and pick the right size and you’re sure to have a beautifully protected feline pet. 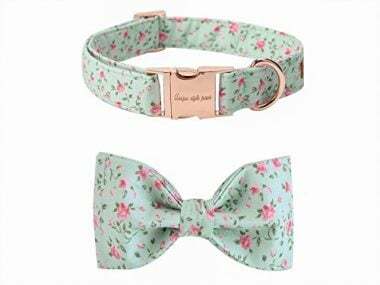 Secure, personalized and comfortable, the FlowerTown’s cat collar is one of the best affordable collars you could find. This item comes with embroidery - your phone number and your cat’s name – so, all you have to do is provide chosen information and your kitty will have its own, personalized ID tag at all times. Of course, the collar also has a buckle (quick-release), as well as a stainless steel D-ring, which makes the whole adjustment business really easy. And if your furry pet tends to disappear at night? No worries, the FlowerTown collar’s surface is highly reflective, so your cat can be seen even during his night walks. Also, it has a break-away clasp, so if the cat gets caught, it can be released using moderate pressure. Strong and comfortable? Check. Highly secure and fashionable? Check. The Rogz GlowCat collar checks all the right boxes, and then some. With many safety features, great quality and a modern design, this cat collar is both practical and cute-looking. The Rogz’s cat collar is made from a Glow in the dark and Reflective PU and has a breakaway safety clasp – important features if you’re looking for a super-secure collar that will keep your furry pet safe at all times. Additionally, this breakaway load buckle lets you adjust the setting depending on the size of your cat – if you have a tiny kitty, you can adjust the setting on +6.6 lbs, and if you have a chubby, large cat, you want the +11 lbs setting. 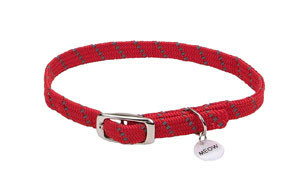 The collar itself features (nylon) scratchproof webbing, making it strong and durable, even if your kitty is a scratcher. 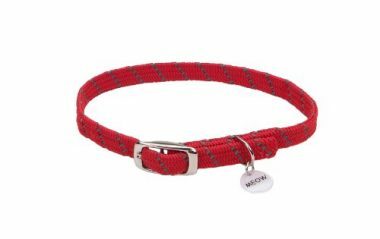 And with five different patterns and colors, it’s easy to find the right looking collar for your pet. If you’re looking for a fashionable way to protect your furry pet, look no further than the Pettsie set. 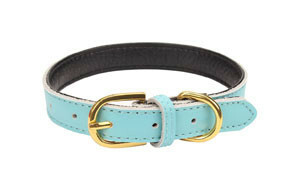 Seriously, this cat collar is one of the cutest, most comfortable and durable collars out there. 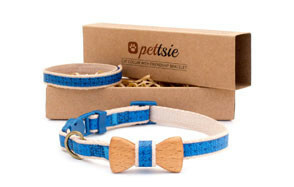 With a wood bowtie for the cat and a matching friendship bracelet for you, the Pettsie set can help you make your friendship with your furry friend official. Made of 100% natural cotton, both collar and the bracelet are comfortable to wear and don't cause any irritation. Importantly, there is a safety breakaway buckle that ensures your pet will be safe in all situations – in case she gets caught, the collar opens immediately with moderate pressure. Of course, the Pettsie collar is adjustable and features a vintage style D-ring which you can use to add your own bell or ID tag. 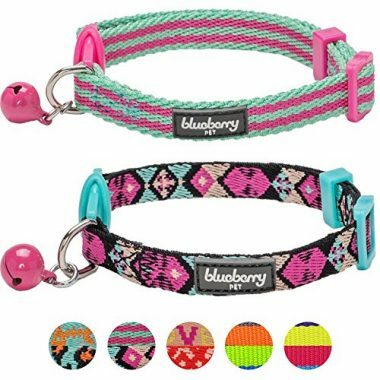 Durable, comfortable and stylish, the Blueberry collar is the classic cat collar that will always keep your kitty safe. Made with high density polyester webbing and environment-friendly plastic, this collar can withstand frequent scratching with ease, and as a bonus, it’s easy to take care of. The breakaway buckle guarantees your kitty remains safe and sound even if it gets caught, while the ability to adjust it (between 9 and 13 inches) makes fitting a piece of cake. The collar also comes with a cute bell, so you can always know your kitty’s whereabouts around the house. There are various colors and geometrical patterns to choose from, so even if your cat (or you, for that matter) is super-picky, it’s easy to find the right style. Last, but definitely not the least, comes the supremely stylish, ultra-comfortable UPS' Pet Soft & Comfy Bowtie Collar. The fabric of the collar is 100% cotton, while the hardware (D-ring) is heavy duty and durable. The little bowties themselves are traditional double bowties, and they’re hand-sewn and attached to the collar with an elastic strap. They can be removed and attached to any other collar without any alterations, so customization is endless. This also means they’re easy to take care of – although they’re not machine-washable, water and a little soap are all you need to keep this collar clean and fresh. Of course, the collar itself is completely adjustable, so you won’t have any trouble finding a perfect fit for your feline pet. There is also a wide selection of sizes, colors and patterns, so finding the right collar specifically for your cat won't be a problem. Despite what some people might think, collars are not only for dogs – cats can benefit from wearing them too. In fact, one of the most important things you can do for your furry pet’s safety is to get her a nice collar with ID tags. Sure, nobody wants their cat to wander off and get lost, but let’s face it – cats are mischievous creatures and it’s wise to try to cover all your bases. But how to decide which cat collar to get? With so many different products on the market, it can be tricky picking the right one. But have no fear – we’re here to help. In this buying guide, we cover some of the most important things you should pay attention to when buying your cat a collar. 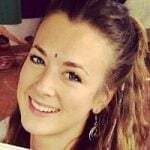 We also answer some of the commonly asked questions, such as ‘Why use a cat collar in the first place’, ‘Are bells useful or are they a hindrance’, and finally, ‘Are microchips important’. So, read on, inform yourself, and get the best collar for your feline pet today. It’s safe to say that cats communicate through their collars – in a case the cat gets lost, her collar lets other people know she is a pet someone cares about deeply. As a result, collared cats are treated better than uncollared pets in general. But is every cat collar the same? Are there certain things you should pay closer attention to? Although all cat collars have the same function, which is to say “I belong to someone”, they’re also all very much different from each other. For example, some collars will have a breakaway feature, while others won’t; some will come with bells, while others will not; and some collars will be visible at night, while others won’t be. Does your cat wander off during the night? If he does, make sure you get a collar with a reflective, glow-in-the-dark material that will ensure your kitty is seen on dark roads. Does your cat have a medical condition? If she does and she needs regular medication for management, make sure you disclose that on her collar. Is your cat extremely quiet? If he is and you’d like to be able to hear him while he explores in the dark, consider getting a collar with a bell. Is your cat the ultimate explorer? If she is, you may want to purchase a collar with a breakaway function, to ensure she’s able to pop it open and escape in case she gets caught on something. All in all, there are quite a few things to consider before buying your cat a collar, but ultimately, what’s important is to get a collar that works specifically for you and your cat’s needs. Affordable, because if it doesn’t fit your budget, it’s not worth it. Besides these basics, there are other features you should be looking for when buying a cat collar. As mentioned, a breakaway feature is crucial for super-curious cats who often find themselves in sticky situations. With this function, if your feline friend gets caught on something, it won’t choke because the collar will pop open and the kitty will be able to escape. 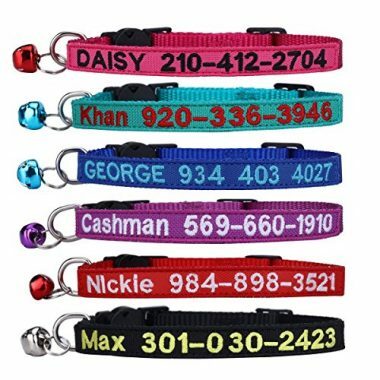 A good cat collar needs to have a place where your cat’s identification is displayed, such as his name and address, or your phone number. This can be done by attaching ID tags, or by using custom embroidery. Cats love to wander the streets at night. Unfortunately, unlike cats, cars don’t have night vision, which is why it’s important to get a collar made of reflective material that can help drivers spot your cat on the road. Of course, if your cat is an indoor cat only, you can skip the glow-in-the-dark material and just go with a regular collar. We have ‘what to look for’ covered, so it’s time we focus on what to avoid when purchasing a cat collar. A good cat collar needs to be sturdy but flexible so you can find a good fit for your cat. Avoid cheap-looking, weak materials that easily loose threads or fall apart – not only do these collars look bad, they can compromise the safety of your cat. A small bell is cute and can be useful, but large, overly noisy bells? Avoid those, as not only will they irritate your cat and make her want to get her collar off of her all the time, but they will start annoying you sooner than you think. Plus, if they fall off, they can become serious choking hazards. Flea collars may seem practical, like you’re killing two birds with one stone, but beware – many flea collars are made of irritating materials that can cause allergic reactions and make your kitty sick. Q: Why Use a Cat Collar? A: If your cat spends most of her time inside a house, you may be wondering, why use a cat collar at all? The truth is – if you’re absolutely sure your cat doesn’t leave the house ever, you don’t have to. However, if you want to make sure your feline companion is safe at all times and all situations, it’s a good idea to get her a collar. Safety: a collared cat says “I have a home, please take me back”, while the uncollared pets often get mistaken for strays or ferals. Health: if your kitty has medical issues and he needs to take medication or eat only certain foods, a collar with medical ID tags can be a lifesaver in case he gets lost. Personal style: if you want your feline friend to express her own style (or perhaps yours), a collar is a great way to do it. A: Many cat collars come with cute little bells that are supposed to make your kitty look more dashing, as well as safer, especially if they like to wander around the house in the dark. But what if your cat likes to spend some time in nature – will the bell keep her from catching birds, mice and other small animals? It’s unlikely. Cats are the ultimate predators who know how to perfectly stalk, so they have no problem staying quiet even with a bell on their collar. Besides, most bells only make quiet sounds, so it’s highly unlikely this accessory will put a stop on bird-killing. A: Microchips, or chips containing information linking you to your cat that are subcutaneously inserted into your pet, can be highly useful, as they can help you find your kitty even if she gets lost or someone takes her. But is microchipping your cat necessary? Not really. Many people choose not to microchip their pets because they don’t want to stress them out or they have opposing moral reasons. If that’s you – have no fear, your cat can be perfectly safe without a microchip. A cat collar with ID tags is all you need to keep your furry friend safe and sound in all situations. With a name, address or your phone number on her collar, your cat will have a voice that will prevent her from being stolen or lost for an extended period of time.